Mars was terraformed, and the biotech engineers could walk on Luna without breathing gear. Earth had three moons and hundreds of orbiting habitats in the Clusters. The great Terraforming Project was hitting its stride, but there were conflicts over which nations would get favored colonization sites on Luna and the antitechnology Three Sins cult was demanding that it all stop. But what disturbed Dr. Bet Nomad, circuit doctor for many of the minor habitats in the Clusters was a simple cough that seemed to be found every place she visited. The more she learned, using banned genetic technology, the tighter her own limitations restricted what she could do—she was banned genetic tech herself, living in the shadows lifetime after lifetime. But she was certain something was wrong­—something evil. 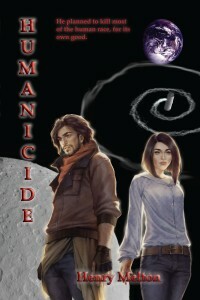 Humanicide is the final chapter of the Earth Branch of the Project Saga.